Consumers continue to ramp up spending -- and that's very good news for both Visa and MasterCard. Shares of the card giants popped Thursday after both logged strong quarterly profits and China announced it will open up its credit card and payment market. "People are using their credit cards a little bit more. That's actually healthy. Consumers have been extremely debt averse -- too much so," said James Friedman, an analyst who covers both companies at Susquehanna Financial group. Visa (V), the largest credit and debit card company in the world, said consumers made $1.2 trillion of payments to merchants during its fiscal fourth quarter. That's an 11% increase in so-called payments volume from the year before. And it's not like all the strength was coming from fast-growing emerging markets. Visa CEO Charles Scharf noted particular strength in the U.S., where transactions grew 8% in the three months that ended September 30. There's growing momentum for U.S. credit growth. Visa has seen credit card balances rise for much of the year and the pace is accelerating this fall -- up 15% so far in October. MasterCard (MA) also reported earnings that exceeded expectations, driven by a 12% jump in gross dollar volume, or GDV. 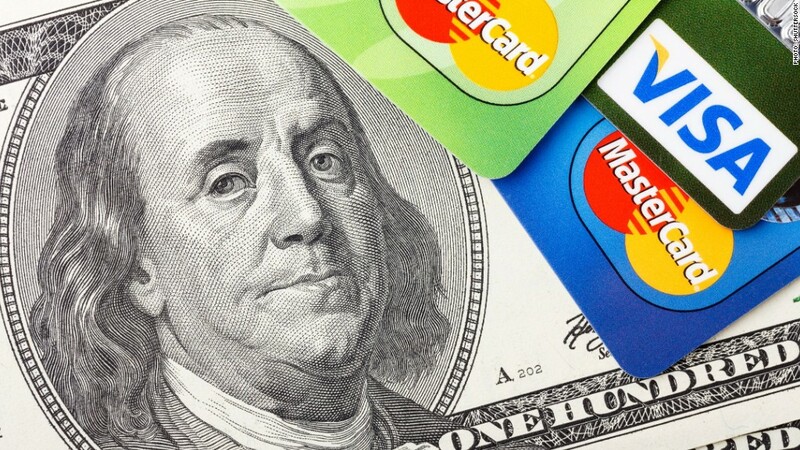 That metric measures purchases and ATM withdrawals with MasterCard-branded cards. Of course, it's not exactly full steam ahead for the card companies. Visa said its near-term outlook "remains cautious" due to the "modest pace" of the recovery, geopolitical tensions, Ebola and the stronger U.S. dollar. Still, the strong reports back up new government data released on Thursday that show the U.S. economy grew at a solid 3.5% pace in the third quarter, boosted in part by a rise in consumer spending. Investors were definitely pleased with the corporate report cards. Visa, which also unveiled a new $5 billion share buyback plan, soared 8% on Thursday morning. MasterCard rallied nearly 7%. China opens up: Wall Street is also salivating over China's announcement late Wednesday that it will end its payments monopoly. The move could give American card companies access to a tantalizing market worth $1 trillion and and expected to rise rapidly. "China is a hugely important geography that previously these companies really could not penetrate," said Friedman. Visa and MasterCard were also helped by increased turbulence in the currency market, which is actually a good thing for these companies. But the foreign exchange fluctuations can also be a double-edged sword because a stronger U.S. dollar can hurt revenue from overseas.